In Unofficial Vote, Venezuelans Overwhelmingly Reject Constitutional Rewrite : The Two-Way Roughly 98 percent of voters in Sunday's symbolic referendum rejected President Nicolas Maduro's plan to rewrite the constitution. Still, Maduro has dismissed the vote as "meaningless." Activists celebrate Sunday in Caracas after voting in an opposition-organized referendum on President Nicolas Maduro's plan to rewrite Venezuela's Constitution. Just two weeks before an election to decide the delegates who will rewrite Venezuela's Constitution, opposition activists held a symbolic vote of their own on Sunday. In the nonbinding referendum, roughly 98 percent of voters rejected President Nicolas Maduro's plan to replace the constitution. More than 7 million Venezuelans voted in the referendum, according to the local university administrators tasked with overseeing the vote. NPR's Philip Reeves notes that number — which includes nearly 700,000 expatriates who voted overseas — makes up about a third of Venezuela's registered voters. "It's a way to show how many people are actually against the government, and to give support to people that are actually doing the protests and have been arrested," expat Andrea de Lima, who participated in South Florida, tells reporter Keyvan Antonio Heydari. Still, Maduro has vowed that Sunday's referendum will do nothing to stall a July 30 election for delegates for a constituent assembly, which will be responsible for rewriting the country's 18-year-old constitution. That rewrite would have the capacity to dissolve the National Assembly, an opposition-heavy body of lawmakers that has been a source of frustration for Maduro for years. "Yesterday, the Venezuelan people again made clear that they stand for democracy, freedom, and rule of law. Yet their strong and courageous actions continue to be ignored by a bad leader who dreams of becoming a dictator. "The United States will not stand by as Venezuela crumbles. If the Maduro regime imposes its Constituent Assembly on July 30, the United States will take strong and swift economic actions. "The United States once again calls for free and fair elections and stands with the people of Venezuela in their quest to restore their country to a full and prosperous democracy." It was an earlier attempt to dissolve the legislature — an attempt made by the Supreme Court, then quickly reversed in early April — that set off more than 100 days of unrest in Venezuela. The anti-government protests, and their clashes with government security forces, have seen nearly 100 people killed and more than 1,500 injured in the 3 1/2 months that followed. The referendum Sunday was also marred by violence. A 61-year-old nurse was shot dead and three more were injured when men on motorbikes — described by the opposition as members of a "paramilitary" — opened fire on a polling place. Maduro has positioned his proposed constitutional rewrite as a solution to this continuing unrest, calling Sunday's vote "a meaningless internal exercise." But NPR's Reeves says the unofficial referendum does send a message. "It clearly states that Maduro is as deeply unpopular as he has long been thought to be, and it shows, as the polls have suggested, that Venezuelans are overwhelmingly against the idea of establishing a constitutional assembly," he reports. 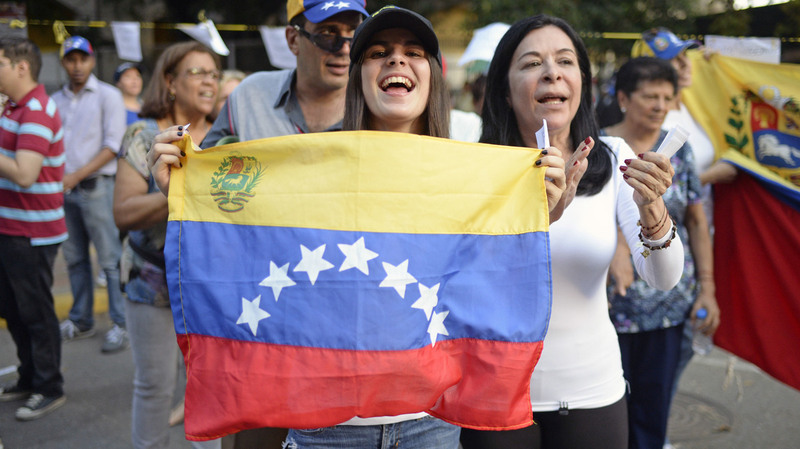 And NPR's Greg Allen says that sentiment extends to Venezuelans living in the U.S. One expatriate, Mario Di Giovanni, tells Greg that while the vote isn't official, the process is supported by Venezuela's Constitution. "So for us it's binding," Di Giovanni says, "and we are following the constitution."